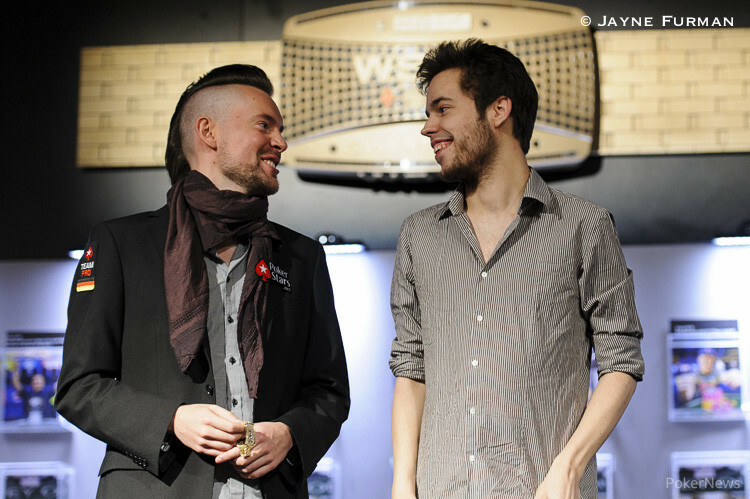 The Event #18: $10,000 Seven-Card Razz Championship has finally come to a conclusion with Germany's George Danzer being crowned the Champion after besting a 112-player field for his first World Series of Poker bracelet! On Friday evening, 112 players took to the felt for the biggest buy-in Razz Championship of all time - besting the $5,000 buy-in won by Huck Seed in 2003. Not only was this tournament the biggest of all time, but it was also the first time since 1977 that more than two Razz tournaments have been on the WSOP schedule. With such a small field, unique game and big buy-in, an all-star field took a seat in this tournament, and as multiple bracelet winners and big name poker players were bounced to the rail throughout Day 1, just 74 players survived. Day 2 would be filled with a flurry of eliminations as play was fast-paced leading up until the bubble period which eventually saw Jesse Martin earn the moniker of bubble boy. Scott Clements, Nick Schulman, Hoyt Corkins and Paul Volpe would round out the in-the-money eliminations as just 12 players would return to battle it out today. Action began with Day 1 chip leader Thomas Butzhammer (12th) and Roland Israelashvili (11th) falling to the rail before a string of bad cards ended Daniel Negreanu's run at a seventh WSOP bracelet and second final table in 10th place. Play would then slow down on the unofficial final table before Dan O'Brien and his short stack hit the rail to leave just eight players eyeing WSOP gold. 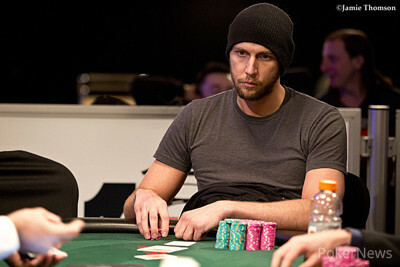 One of those players was David Bach who has made the previous two Razz final tables, but unfortunately for the 2009 $50,000 H.O.R.S.E Champion, he would bow out in 8th as fellow WSOP bracelet holder Naoya Kihara followed him in 7th. Todd Dakake (6th), Brian Hastings (5th) and Yuval Bronshtein (4th) would all be next out the door before a long three-handed battle would follow as Brandon Shack-Harris - who won a bracelet in Event #3 - looked in complete control with more than 70% of the chips in play. Short-stacked Todd Barlow would then go on a run of doubles before eventually taking 3rd to leave Shack-Harris trailing Danzer by just three big bets. The two took their turn holding onto the lead, but once Danzer regained it he started to apply the pressure and pushed it to a greater than eight-to-one advantage that left Shack-Harris with just three big bets. Shack-Harris however wasn't going to quit that easily and doubled three times before the final hand saw Danzer make a against Shack-Harris' ten-seven. 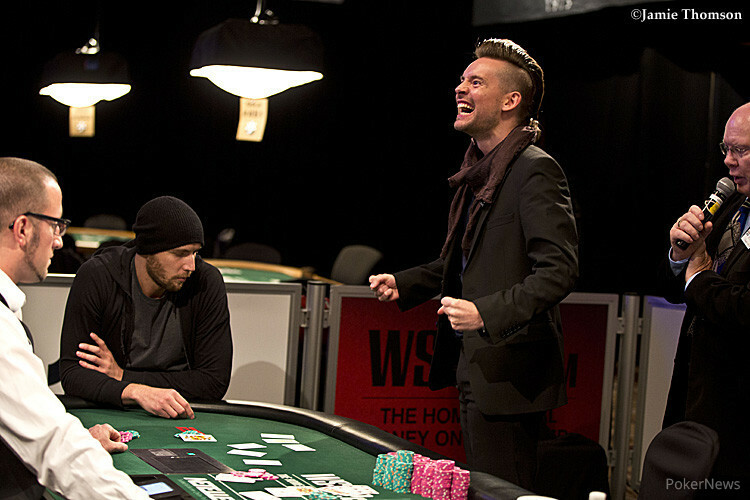 Although Danzer may have prevented 2014 WSOP history being made with a double bracelet winner, he creates his own history as he captures his first WSOP bracelet from his eighth final table and tenth cash. 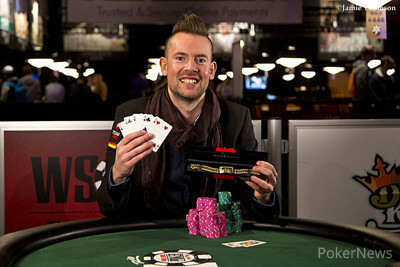 He also now joins a list of German players that includes Pius Heinz, Dominik Nitsche and Katja Thater as WSOP bracelet winners. Congratulations to George Danzer for capturing his first WSOP bracelet in the biggest buy-in Razz Championship of all time! Brandon Shack-Harris Eliminated in 2nd Place ($182,155); George Danzer Wins! Brandon Shack-Harris had the bring-in and George Danzer completed to 80,000. Shack-Harris responded by raising only to have Danzer re-raise as Shack-Harris committed his 220,000 total. With Shack-Harris having a made ten-seven, Danzer was drawing to a six, and when he sweated his final down card he slammed down the in celebration. Shack-Harris could only pair up with the and would have to settle for a 2nd place finish for $182,155 following his first bracelet just a few days ago. With Shack-Harris making a perfect seven, he has now doubled three consecutive times. George Danzer completed and Brandon Shack-Harris raised. Danzer re-raised and Shack-Harris called all in for his last 215,000. The all in happened in a flurry of action with the cards being mixed round, but in the end, Shack-Harris doubled through to 450,000 in chips. George Danzer and Brandon Shack-Harris have decided to forego the break and play through into the next level. Brandon Shack-Harris completed and George Danzer called. Shack-Harris fired out on fourth before both players checked fifth street. On sixth, Danzer bet and Shack-Harris mucked.